Stubbornness appears to be a quality synonymous with great management. The master of this trait was probably the late Brian Clough. When asked how he handled players who disagreed with him, Clough famously replied, “We sit down for 20 minutes, talk about it and then decide I was right”. This uncompromising style brought great success to Derby County and Nottingham Forest and Clough is fondly remembered as arguably the greatest English manager of all time. Sir Alex Ferguson, Arsène Wenger and José Mourinho, to name three, still espouse amplified levels of obstinacy and the results at club level have been phenomenal. Yet there is one figure from the ‘old school’ of management whose inflexible style is producing negative results and is in danger of clouding his remarkable managerial career – Giovanni Trapattoni. When the FAI appointed Trapattoni as Ireland manager in 2008, the Italian had just finished a two year spell at Red Bull Salzburg. There, in 2007, he joined a select group of managers to have won league titles in four different countries. Alongside this achievement in Austria, ‘Trap’ had won titles in Italy (Juventus and Inter), Germany (Bayern Munich) and Portugal (Benfica). If that wasn’t impressive enough, Trapattoni is also the only manager to have won all international clubs competitions (European Cup, Cup Winners’ Cup, UEFA Cup x3, Super Cup and Intercontinental Cup). It goes without saying then that his appointment was a real coup for the FAI, notwithstanding the fact that the disappointing tenure of Steve Staunton was very much a recent memory. A comparison of their respective CVs has laughable results – Staunton’s only previous managerial experience had been a brief stint as assistant coach at Walsall. Ireland greeted Trapattoni with open arms; such fervour for visitors from Italy was usually reserved for the Pope. He arrived with an entourage too, who quickly became as recognisable as the manager himself. Marco Tardelli, the vein-bursting face of Italy’s 1982 World Cup winning side, and Liam Brady, the former Arsenal midfielder who had played under Trap at Juventus, joined as assistant managers. Fausto Rossi, who had worked with Trapattoni at Fiorentina and for the Italian national team, also joined as Fitness Coach. However, most famous out of the new faces was Manuela Spinelli, Trappotoni’s interpretor. Due to her ability to translate “Trappotonese”, Spinelli was soon a hit with the Irish public, even finding herself interviewed on Irish national television without the manager. These were halcyon days for the new regime. Ireland finished the 2010 World Cup Qualification campaign undefeated, a feat they had only achieved twice previously. The ‘Boys in Green’ found themselves in a difficult play-off against France. Yet, were it not for the hand of Thierry Henry in a highly controversial incident in the second leg in Paris, Ireland might have found themselves playing in South Africa. Deflated and hard done-by, Ireland soldiered on. Where Trapattoni might have walked away from the job, he carried on, honouring the contract he had signed prior to the play-off: there was clearly unfinished business at stake. He had shown fans that this Ireland side could compete with Europe’s best and in the next qualification campaign, they went one better, defeating Estonia 5-1 on aggregate to qualify for Euro 2012. However, in the buildup to the tournament there were already signs that Trapattoni’s Irish honeymoon was coming to an end. His style was continually becoming stubborn and reckless, thus undermining the good work he and his team had done to get there. The main source of frustration for Trapattoni was his mishandling of players who could have formed the basis of a reasonably competent line-up to take to Poland. A series of petty disputes saw some of Ireland’s key players ostracised, while the manager continued to alienate supporters with his outspoken media presence. In a cruel move by Trapattoni, Wolves winger Kevin Foley was cut from the final Euro 2012 squad just half an hour before it was submitted to UEFA. Having been named in the manager’s initial squad, Foley described the decision as “a kick in the balls”. He must have felt no better when his replacement Paul McShane did not play a single minute in Poland, and he has since vowed never to play for Ireland under Trapattoni. There were also concerns that Trapattoni was seriously overlooking a talented crop of young Irish players. There was no place for Seamus Coleman in the final 23, while Trapattoni appeared unsure about handing James McClean his big break. Everyone in the Irish game suddenly seemed to know best; following a friendly against Bosnia-Herzegovina, Roy Keane and Andy Townsend suggested McClean would be a more suitable option in the starting XI than the more experienced Aiden McGeady. Trapattoni hit back, stating, “I don’t listen to ex-players. I think the manager is better in this situation”. While a manager may often know best, this does not mean he cannot heed the advice of others. Trapattoni’s own ignorance was also laid bare when he said, “I know Roy Keane. I don’t know this other person (Townsend)”. Townsend had captained Ireland at the World Cup in 1994 – an iconic side for most fans. A 0-0 draw to Hungary in Ireland’s last match before the Euros did little to raise expectations, but this did not stop Irish fans travelling in their thousands to enjoy their country’s first major tournament since the 2002 World Cup. When Ireland were handed a group with Italy, Croatia and World Champions Spain, it was clear that they would need a miracle to qualify for the knockout stages. However, they could have been expected to give a better account of themselves. A defence that had been so hard to beat in qualifying, recorded a goal difference of -8, equalling the worst performance in Euros history. Throughout the tournament, Trapattoni was reluctant to ever change his system and stuck by older players, who weren’t performing, rather than gamble on exciting and younger talents – namely McClean and West Brom striker Shane Long, who amassed less than an hour’s football between them over three games. It was starting to become clear that the last few years had been spent speculating on who Ireland’s best players were, when the deputies at Trapattoni’s disposal had hardly been tested at international level. McLean and Long had both had impressive seasons in the Premier League and could have helped lead a quicker and perhaps more penetrative attacking line than the ageing Robbie Keane and inconsistent McGeady. Trapattoni was unlucky to lose 21-year-old Wigan midfielder James McCarthy before the Euros due to compassionate leave. While McCarthy is now starting to become somewhat of a regular in the side and performing fairly well there, he has played so few matches previously it is difficult to gauge. Ireland could look to England’s example here, who have done remarkably well at fast-tracking talented youngsters into the senior squad when they appear ready. As much as anything, it is about learning how to integrate quickly into the senior setup as teenagers Alex Oxlade-Chamberlain and Jack Butland would no doubt testify. Yet Ireland are now continuing to pay the price of Trapattoni’s stubbornness in their 2014 World Cup qualifying. In another series of personal spats with his players, the Italian labelled Long as “idiotic” after the striker claimed he was fit to play in the August friendly against Serbia. Long made the point of telling the media he was fit to play in the fixture but was sidelined by his manager. He has only started one match since – a friendly against Oman played at Craven Cottage – despite playing a part in Ireland’s comeback away to Kazakhstan. In that same game, it was McClean who was also left disillusioned with his manager’s actions. 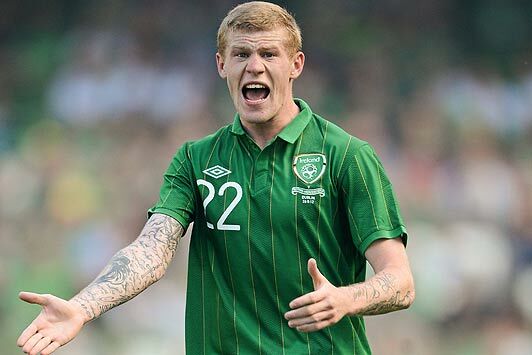 McClean, an unused substitute, tweeted after the game, “Delighted as a fan we got the win. Personal level #fuming #fuckinjoke #embarrassing.” While the young Derryman was clearly out of line here, Trapattoni’s response was to give him a very public dressing down in front of the squad in London. This will do no favours to McClean’s confidence when he is still bedding into the Irish team and it is bizarre that he is not starting anyway. 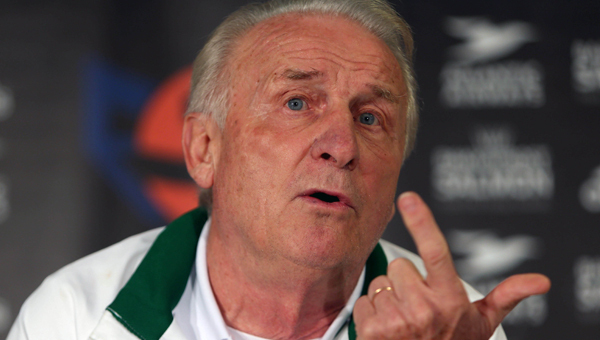 Trapattoni promised change after the Euros but it has not happened. After scraping through against Kazakhstan, the 6-1 defeat to Germany in Dublin was a downright embarrassment and a performance reminiscent of European minnows like San Marino or Lichtenstein. His failure to look to the future has left Ireland in limbo; Shay Given and Damien Duff have retired, while Keane is not far off but their potential replacements cannot be expected to be an instant hit when they have barely played. A 4-1 victory against the Faroe Islands can never be vindication. 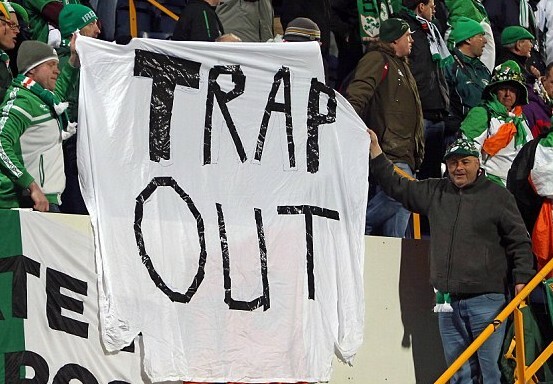 The FAI were noncommittal after the match, with the indication being they will part company with Trapattoni shortly. Much has been made of the huge compensation package, expected to be around £3 million, that the departing manager would receive. This is a small price to pay to put Ireland back in the right direction. 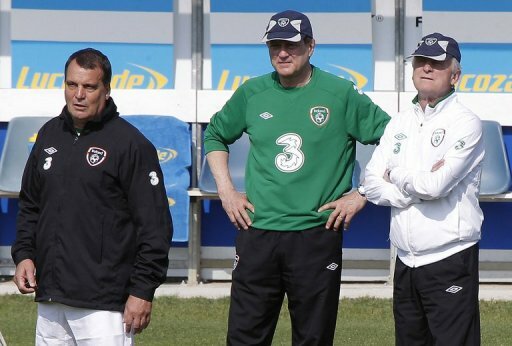 The FAI also have a ready-made replacement, a man who is out of work and understands what it means to manage this side. Mick McCarthy took Ireland to the 2002 World Cup, a period that Irish fans love to hark back to – Robbie Keane’s last minute equaliser against Germany anyone? His conflict with Roy Keane before the tournament was divisive, but of the candidates who are available and Irish, McCarthy must surely rank very high on the list. As well as having a better knowledge of Irish players, he would also be able to communicate with them more easily. The FAI should do the right thing soon, before their hopes of Brazil in 2014 are put in jeopardy. This entry was posted in Analysis and opinion and tagged aiden mcgeady, andy townsend, boys in green, brazil 2014, euro 2012, fai, Fausto Rossi, Giovanni Trapattoni, ireland, james mcclean, Manuela Spinelli, Marco Tardelli, mick mccarthy, robbie keane, roy keane, Steve Staunton, thierry henry by Hugo Greenhalgh. Bookmark the permalink.